Montel Williams has MS. When Cir and I first found out that Montel had multiple sclerosis, we were so amazed. It's so easy to forget that celebrities are ordinary people who sometimes get sick. Around the same time Montel announced that he had MS, Cir was going through a difficult time. He had (we both had) come to the realization that he probably wouldn't be working for much longer. It was a hard thing for him to deal with. And me as well. Because Montel Williams was African American and male Cir could relate to him - much more than a lot of the others he knew. Not to say that there are no other males or African Americans who have MS. There's Richard Pryor and Lola Falana, to name just a couple. Montel's talk show, The Montel Williams Show, is a great platform for getting the word out about multiple sclerosis. This is not his main objective, of course, but he does do shows that focus on the disease he shares with so many others. Not knowing exactly what multiple sclerosis was, Montel thought he had been given a death sentence. He had heard of MS before and was aware that it caused pain. He also knew he could possibly lose control of his body. After reaching a low that made him consider ending it all, he finally realized that his family needed him and loved him. He made a choice to use his unique situation to make a difference in the lives of so many others who suffered with multiple sclerosis just like him. After consulting with experts, reading every book he could find, and talking with others who lived with multiple sclerosis, he came to a realization. He had been in denial for more than 20 years and had been having episodes all that time. It was in 1999 when he decided to go public. Others warned him that it could harm his career as a talk show host. But Montel had to be true to himself. He couldn't remain silent when there was so much work to be done. He knew he had to talk. He had to get the word out. He would use his voice to make sure every one knew about MS. He not only talked about multiple sclerosis on his show, but he also started The Montel Williams MS Foundation. The foundation uses 100% of the contributions it receives for research toward a cure for MS. I believe Montel is a true champion in the cause to end multiple sclerosis. 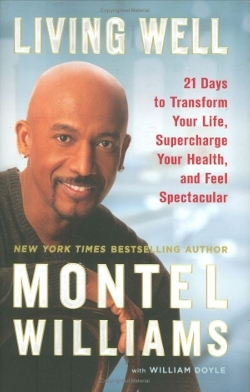 His book, Living Well: 21 Days to Transform Your Life, Supercharge Your Health and Feel Spectacular, is about the lifestyle plan that helps him manage his MS.
Below are a few short video excerpts straight from Montel. Listen, learn, and be encouraged and inspired to live well in spite of your MS. And if you'd like to know more about how Montel stays fit and healthy, click the link. Want to find out the secret to Montel's powers? Click here. (Shhh...It's not really a secret). And if you'd like to see some of Montel's healthy recipes, click here. Here's a great place to find deals on Montel's books? Click the Amazon link below. (Click Ctrl and then the link to open in a new window). Go from Meet Montel Williams! back to Famous People with MS.